Shoe Zone has closing down sale signs in the windows again but unlike in the past when the sale is over yet the business has remained in town this time it sounds as if it really is going. Rumour has it the business will go towards the middle of April and that The Works, who sell gifts, arts, crafts, toys, books, and stationery, will move into the premises at 11-15 High Street, Uckfield. Shoe Zone, closing down signs in the window … again. Shoe Zone went on the market with Oldfield Smith & Co last summer. 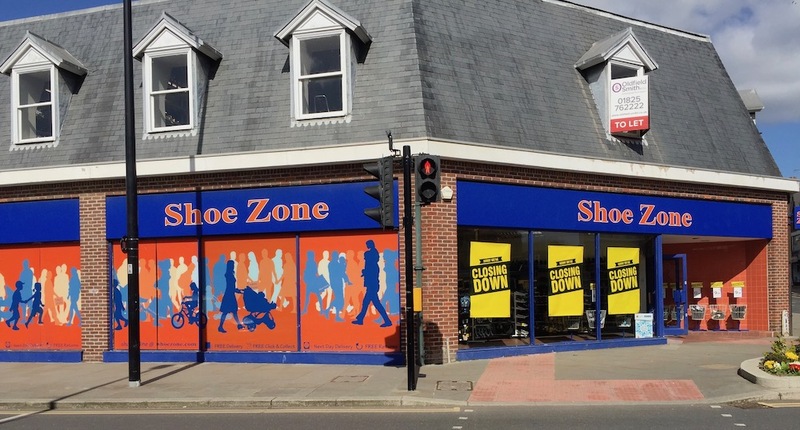 See the story we carried on Uckfield News at the time: Uckfield’s Shoe Zone premises on the market. Letting agreed signs have gone up on other Uckfield premises, including the coffee shop next to the bridge over the River Uck, the former Fluffy Side Up at 75 High Street, and the former Rose and Olive tearooms at 156 High Street. 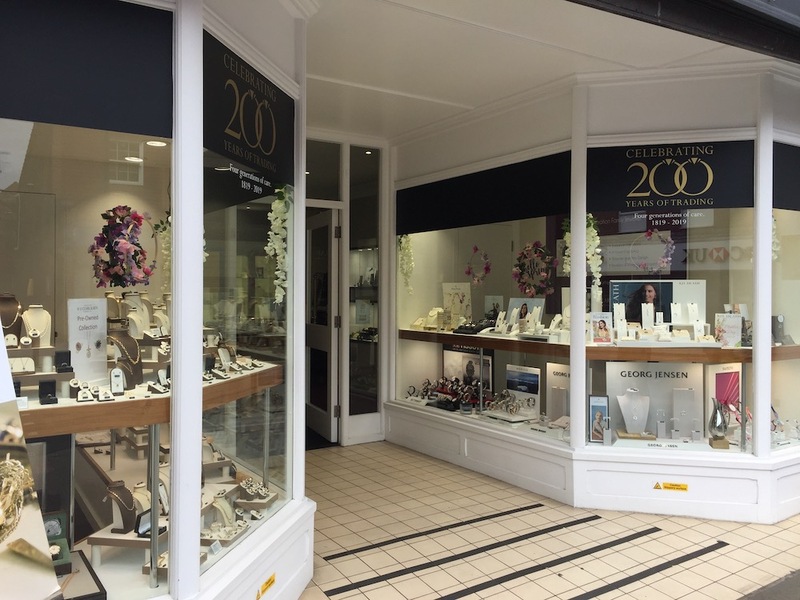 Read on for more Uckfield shopping news. Our monthly feature, this time for April, highlights what’s new in our shops and where there are special events coming up. A Clarins make-up demonstration is due to be held at Kamsons Pharmacy in Uckfield High Street at 6.30pm on Tuesday, May 28. It will cost £10 to reserve your space but that can be redeemed against the purchase of any Clarins product during the evening. You will also be given a raffle ticket on arrival to be entered into a draw to win a Clarins goodie bag. Please call 01825 762959 to book. Foster Grant sun glasses have just arrived at Kamsons and so has a new Clarins sun care range. Look out too for special Bronnley Easter egg soaps. 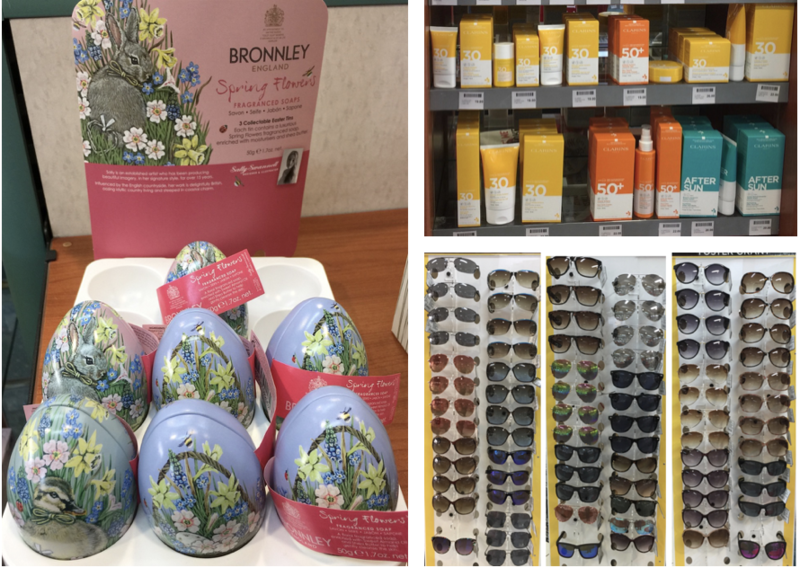 Bronnley Easter egg soaps, Clarins’ new sun care range, and Foster Grant sun glasses – all at Kamsons Pharmacy in Uckfield High Street. New stock is constantly arriving at Josefina and you’ll find lots of gifts there that are ideal as Easter treats. Bespoke joinery continues to be popular and you can see contrasting colours below … white pieces in the window and navy in one corner inside the shop. Furniture can be made to your requirements and you can choose the colour too. Toys galore can be found at Something for Everyone and while you are in the shop make sure to look up to see pretty suitcases – many hanging from the walls – which come in different sizes. Toys at Something for Everyone. 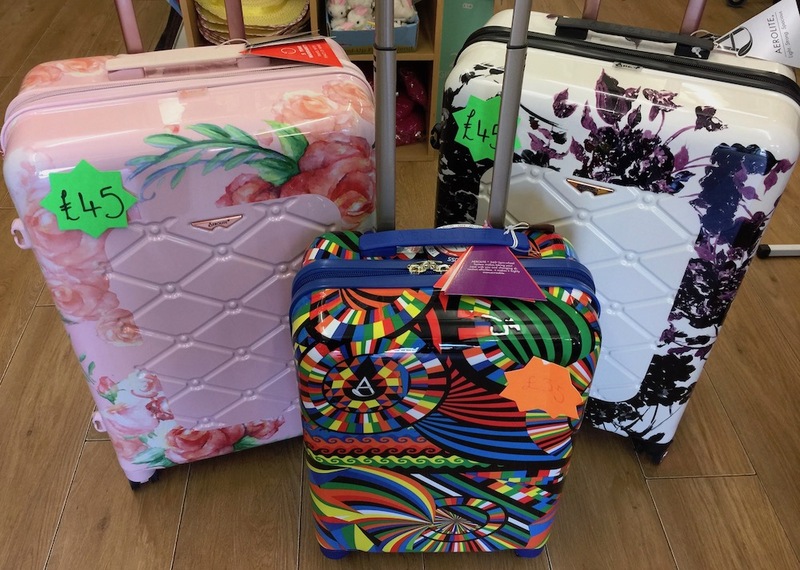 Suitcases at Something for Everyone. The full range of spring and summer stock has now arrived at Cole’s menswear. You’ll find everything you need from short sleeved shirts and polo shirts to light weight trousers and shorts. New to Cole’s are sunglasses – they have never previously been sold there. New crochet and felting kits are now for sale at Sew n Sew … and more fabric has arrived too. 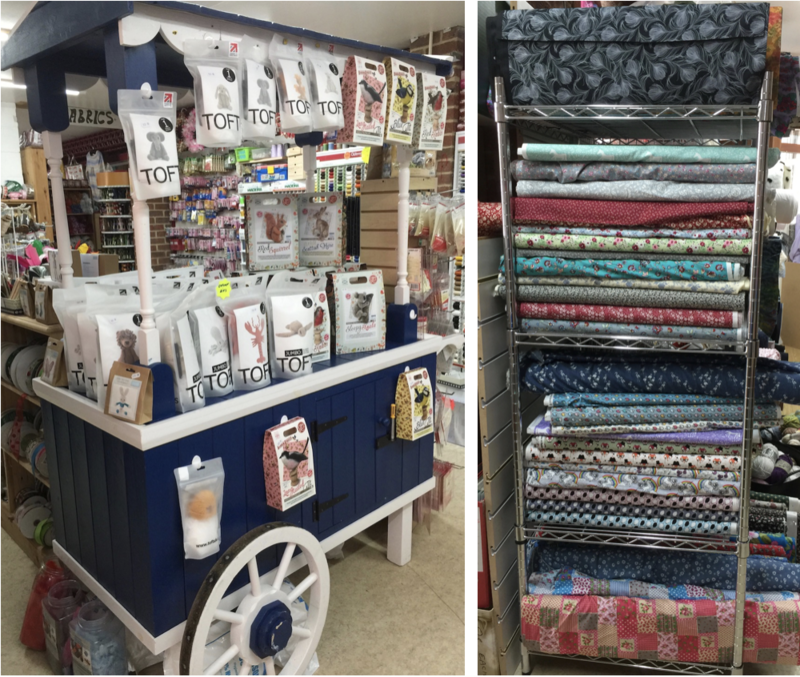 Crochet and felting kits and new fabric – all for sale at Sew n Sew. 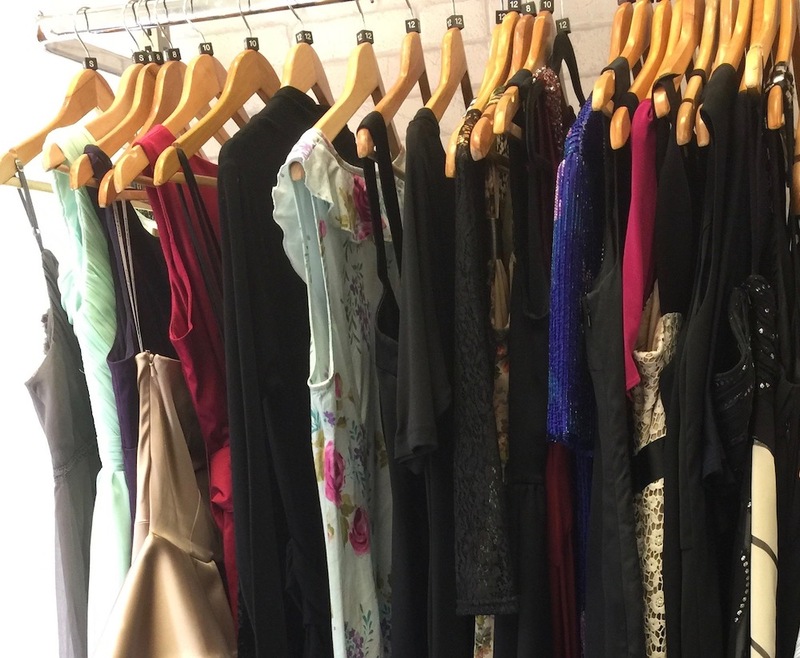 Prom dresses are now on display at Chestnut Tree children’s hospice charity shop in Uckfield High Street – and more are expected during April so it is worth calling in regularly. Prom dresses at Chestnut Tree charity shop – more will arrive during April. Linen dresses for spring and summer – and maxi dresses too – are now in stock at St Wilfrid’s Hospice charity shop. Wedding hats are on display too. Wedding hats at St Wilfrid’s Hospice charity shop. Egg cups, some with legs, and eggs in a variety of sizes are ready to be painted as Easter gifts at Kilnwood Studio. Plenty of other gift ideas are available there too, from bowls, plates and mugs to trinket boxes and popular film and children’s characters. Once you have painted your choice of pottery shop owner Jane DeVay will make sure it is glazed and fired ready for collection. Paint your own pottery Easter egg at Kilnwood Studio. Whether you like cartoons, animals or flowers there will be artworks to suit your taste and, with new stock, constantly arriving it is worth making return visits to the Diane Hutt Gallery. 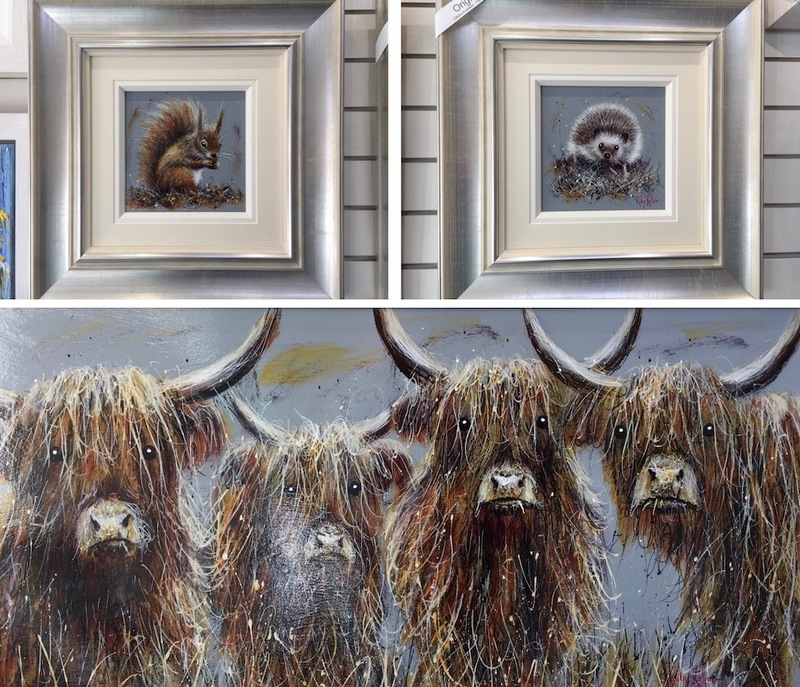 New pieces for April include three paintings from Ruby Keller of cattle, squirrel, and hedgehog. New works by Ruby Keller. Completely different are a Roz Bell acrylic painting with a resin glaze over it, and George Someville’s Patience is a Virtue II of people queuing at a bus stop but all with smiling faces. Lilac Fusion by Roz Bell, left, and Patience is a Virtue II by George Somerville. It’s that in-between season time at PipeDreams with ski wear vying for space now against stock for warmer weather, including flip flops. There is still plenty of ski stock for people planning ski trips over Easter but there is also new season clothing for men, women and children. Board shorts and bikinis will be coming soon. Havaianas flip flops at PipeDreams. New triple sharpened Eagle Claw hooks, which are suitable for carp and specimen fishing are new at Hooked on Green. Robin Eden brand manager at Hooked on Green and neighbouring Green DIY is a keen carp fisherman himself and has used them successfully. Last time he caught five fish up to 44½ lb with them. Robin Eden with a 44lb 8oz mirror carp caught using an Eagle Claw hook. Also new are Peg No 1 and Isolate baits. New bait and hooks at Hooked on Green. 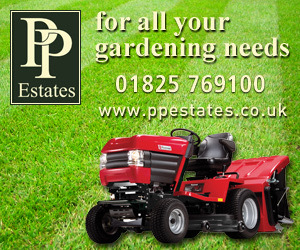 Flat pack furniture is now on display at Green DIY and seasonal products, including lawn mowers are available too. Green DIY will continue to open seven days a week except on Easter Sunday. From lawn mowers to flat-pack furniture at Green DIY. SG Home Interiors is getting ready for spring and has a wide range of garden furniture to choose from, including in teak, weave, or metal. There are teak garden benches and tables in various sizes and a selection of folding and stacking chairs. 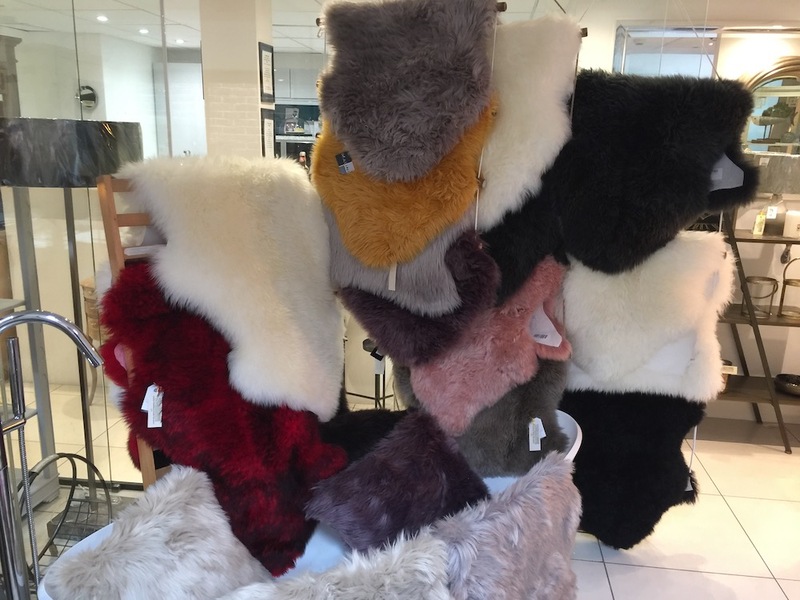 Sheepskin rugs in a variety of colours are also available at SG Home Interiors and coffee and cake can be bought at the showroom which is like a Tardis, much bigger inside than you would think from the outside. New stock is continually arriving. Sheepskin rugs at SG Home Interiors. Staff from W E Clark & Son jewellers are labelling their favourite jewellery in the shop window. Manager Charlotte Roake, for example, has highlighted a colourful Swatch watch. 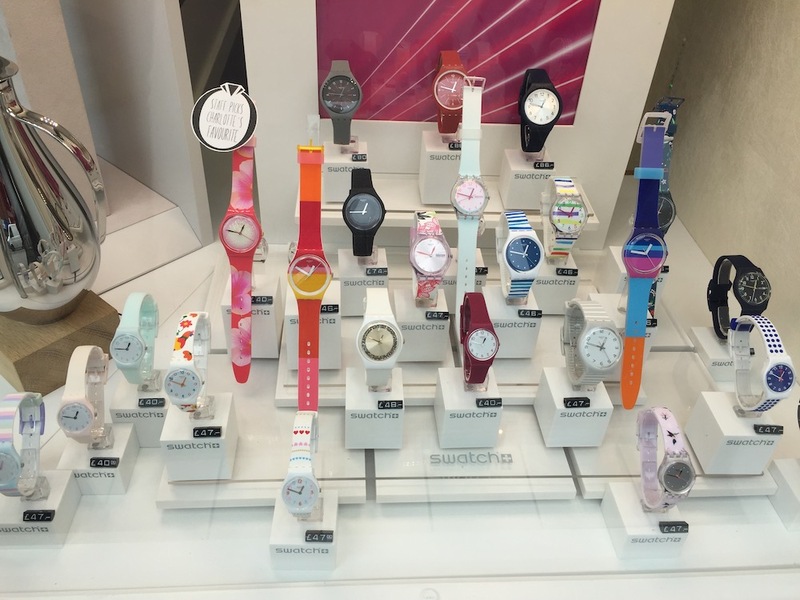 There are lots of new Swatch watches to choose from. New Swatch watches at W E Clark & Son jewellers. Note Charlotte’s favourite with the bright pink and flowery strap, top row, left. Also new are pretty flower pieces of Kit Heath jewellery, and new Georg Jensen pieces include elegant carafes. 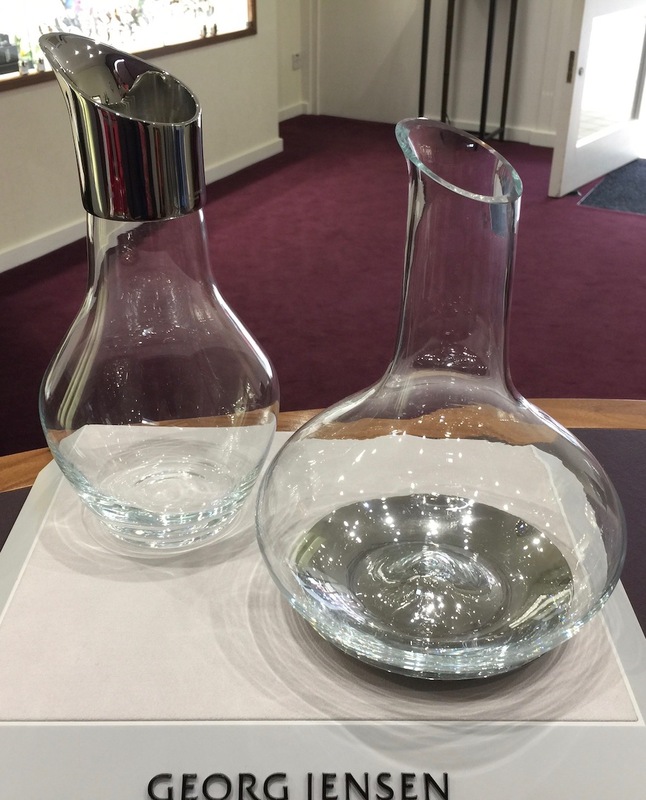 Georg Jensen carafes at W E Clark & Son jewellers. The spring windows at W E Clark & Son. 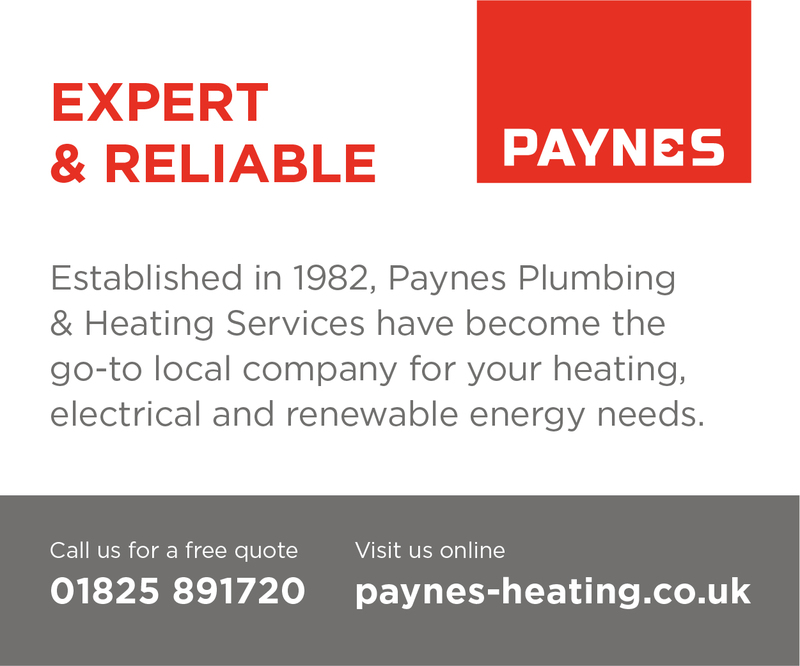 The company celebrates 200 years of trading this year. 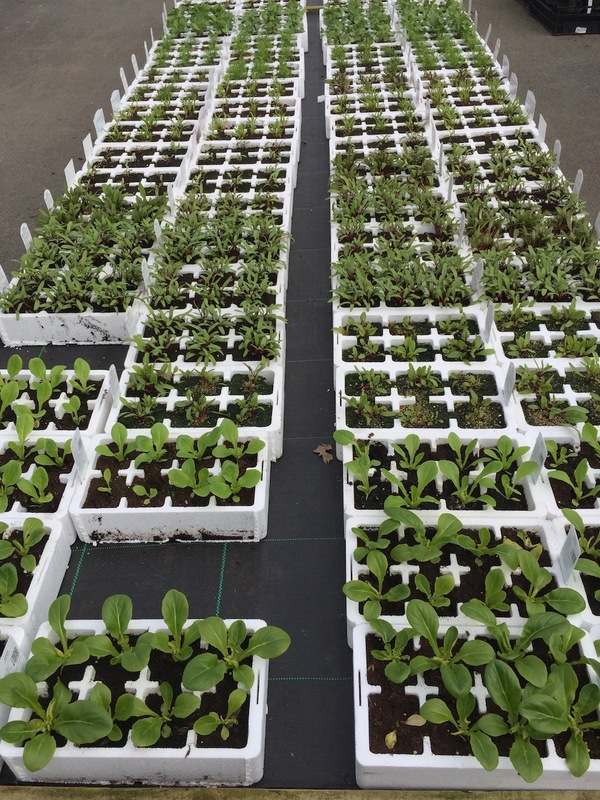 Cabbage, Brussels Sprouts, Leeks, Onions, Spring Onions, Celeriac, Kale, Purple Sprouting Broccoli – all are among vegetable plants now available at Staverton Nursery. Vegetable plants at Staverton Nursery. Look out too for glorious Senetti and perennials. Senetti in a variety of colours at Staverton Nursery. Building of an extension to the retail barn is going well – although progress is hidden from view. Garden furniture should soon be on display. Lily and Me a popular clothing brand, which sells out quickly, has arrived at Chapter Three, so if you are interested in their cotton and linen dresses make sure to call in soon. Lots more spring and summer clothing is now on display and more will be in the shop soon – still to be put out are skirts, shorts and vests. Lily and Me summer prints at Chapter Three. Lily and Me dresses at Chapter Three. There are new breakfast and lunch specials menus at Hartfields, with breakfasts including Bubble and Squeak Potato Cake, with black pudding, streaky bacon, poached egg and Hollandaise sauce, and Make it Vegetarian with flat mushrooms and tomatoes. Lunch specials include light bites of Melted Brie Flat Mushroom with Mediterranean salad, and Smoked Salmon with Celeriac, Potato and Apple Salad. Mains on the lunch specials menu include Sausage Ciabatta Melt with Red Leicester cheese, American mustard, tomato and sliced red onion; Smoked Salmon and Cod Fishcake, with wilted spinach, Hollandaise sauce and a poached egg; and Roasted Veg and Feta Wrap, with humous, sun dried tomato, and rocket – the Feta can be swapped for avocado to make this a vegan dish. New mains on the general menu include Squash, Sweet Potato, Leek and Red Pepper Lasagne, Hartfields Fish and Hand Cut Chips, and Lamb Kofta Flatbread. There are new burgers too: Spanish, Satay Chicken Breast, and Halloumi, Aubergine and Mushroom. A sale is continuing at Final Score sports shop and includes clothing, footwear, rackets, bats, and rugby protection. When you are looking for replacement doors or windows make sure to find a FENSA registered installer, says Superior Glass on the Bellbrook Estate, Uckfield. 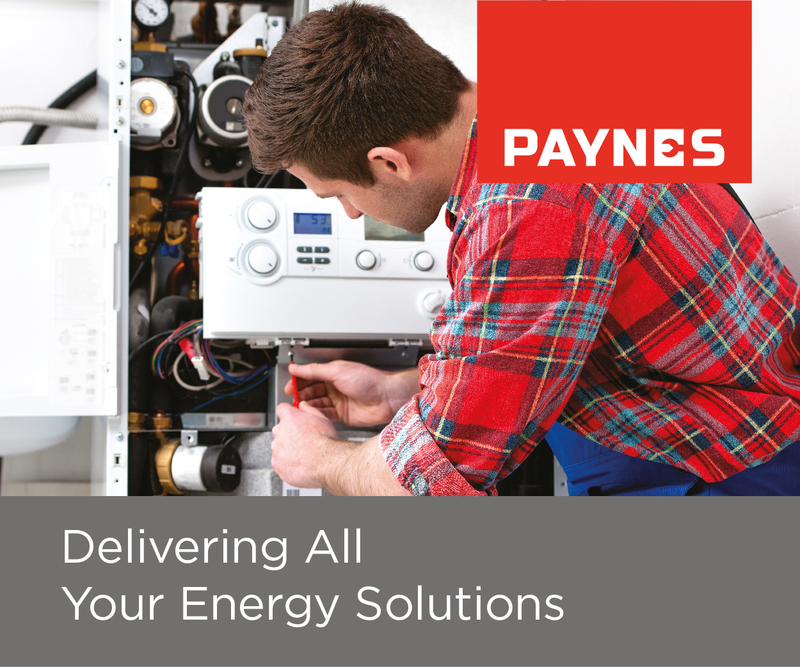 That company is FENSA registered and is assessed regularly to ensure standards are continually maintained. Proof of a job done right. “By using Superior Glass you’ll be issued with a FENSA Certificate, essential when selling the property on,” said a company spokesman. If you are considering blinds that operate via a wireless system Carvills stocks Luxaflex Powerview Blinds. Individual blinds, or groups of blinds, can be controlled with a push of a button, or from your tablet or smart phone with the Powerview App. And you can time when you would like them to open in the morning. Luxaflex also have room darkening blinds to encourage sleep during lighter days – or to cut out sunlight flooding through a window and causing glare on your TV screen. Luxaflex Room Darkening Blinds at Carvills. Some of the blinds soften and filter the light while others can block it altogether. Do ask at Carvills if you would like more information about the options available. Also new at Carvills is Nkuku furniture which includes wooden lanterns, carved from sustainable mango wood, and handwoven armchairs, stools and poufs. There are glass and brass T-light holders, mirrors, and picture frames too. Nkuku furniture, glass and brass T-light holders and wooden lanterns. Fair-trade Kanthi Jewellery can be found at Carvills too. Each bead is hand-carved from wood scraps and covered with Kantha fabric creating striking colourful pieces of art. The company WorldFinds works with artisan women in India, making an impact which extends to families and local communities, creating a new cycle of prosperity, safety and health.